A few weeks ago, my husband, Alex, and I were preparing to backpack the Outer Mountain Loop in Big Bend National Park—a rugged 30-mile trail that crosses the Chisos Mountains and dips into the Chihuahuan Desert—when, only three days before our departure to West Texas, the federal government shut down, meaning no backcountry permits were available. We were forced to come up with a new plan for our Christmas break. We arrived at the national park at sunset and sprinted for Langford Hot Springs on the banks of the Rio Grande. The springs were packed with dozens of other hikers whose plans had been waylaid by the shutdown. One couple mentioned its plans to hike in the nearby state park, a mere consolation prize. Or so we thought. We’d heard whispers that Big Bend Ranch State Park is just as glorious as the national park, but I’m semi-embarrassed to admit that in the half-dozen times I’ve been to the Big Bend region, I’d never once considered exploring the state park. I’m not the only one—due to its remoteness, its relative newness (the Texas Parks and Wildlife Department purchased the former ranch land in 2007), and the shadow cast by its showier neighbor, the state park sees just a few thousand visitors each year. We decided to take a look for ourselves. It was an impossibly clear and sunny day when we arrived at the Barton Warnock Visitor Center at the state park entrance. The ranger informed us that the Rancherias Loop would be our best bet if we still wanted to backpack. The three-day, 19-mile Rancherias Loop promised spectacular scenery in the form of deep canyons, arroyos, and mountainous desert. Not to mention, we’d get the solitude we’d been craving. “Not a lot of people do this hike, so you’ll probably be out there alone,” the ranger said. And for our first 8 miles, we were—totally, blissfully alone. We walked along dusty creek beds, meandered through vast canyons, and crested the ridges of the Bofecillos Mountains, all the while marveling at the raw, astounding scenery surrounding us every step of the way—the exposed volcanic landscape, bluish-purple peaks, and bursts of exquisitely colored winter vegetation, all of it unchanged for centuries. The trail itself is faint in parts, though marked with cairns (stacked-rock trail signals), and the loop connects Casa Reza and Rancherias Springs, two water sources separted by a seven- to eight-hour hike. Well before sunset, we arrived at Casa Reza, a crumbling old ranch outpost next to a grove of cottonwoods, and suddenly, Alex and I were no longer alone. 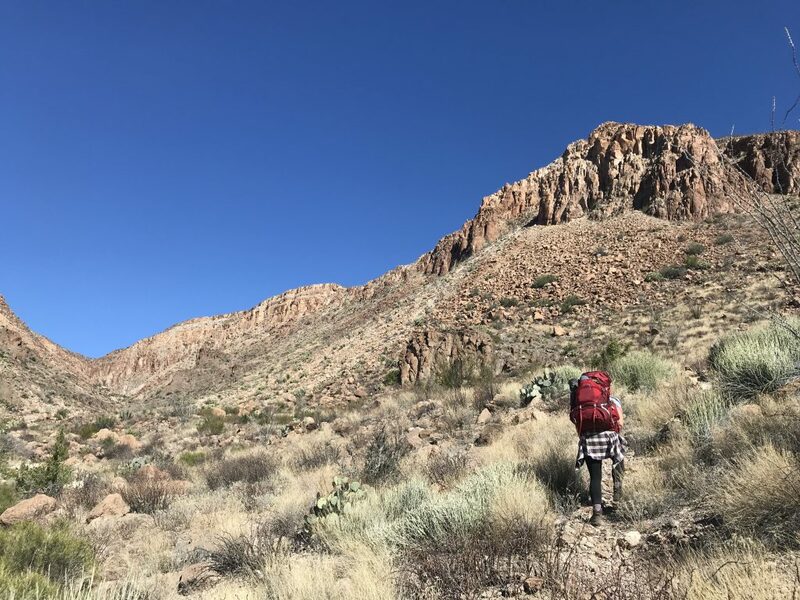 Other groups of hikers began to trickle in, all of us pitching our tents together in the only swath of space free of prickly pear cacti and scrubby creosote bush. Soon, there were a dozen of us. As we traded stories, we realized that we’d all traveled out here to do the same hike—Big Bend’s Outer Mountain Loop—before the government shutdown. We’d found ourselves in a big group, in a place we’d all been told would be desolate. We laughed and enthused over the day’s hike. The state park had been hiding under our noses this entire time—who knew? That evening, as Alex and I made dinner, a fiery sunset of deep reds, oranges, and cotton-candy pink gave way to an enveloping darkness and a thick silence. The stars came out, billions of throbbing pinpricks of light pressed against the blackness and the clearly visible banner of the Milky Way. I didn’t mind that we weren’t alone there in that moon-bright valley. I was just glad we could all be witnesses to such beauty.